Only 48 hours left for Flipkart Big Billion Days sale to end, it’s a worthy time to grab last-minute deals. Initially you could have missed out on some available highlighted offers, but there are still a chance to get some great deals before the Flipkart sale ‪ends on Sunday. At the same time Amazon’s Great Indian Festival sale is going on so before buying, make sure you compare prices. 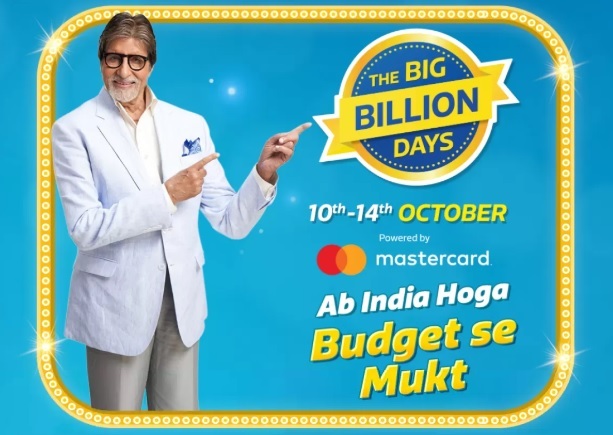 Flipkart has partnered with HDFC Bank to offer 10 percent instant discount on HDFC debit and credit card users during the Big Billion Days sale. Exchange offers and no-cost EMI payment options are available on selected debit and credit cards. If you are looking or keen to buy something, do look these deals on available on Flipkart and Amazon. The Lenovo Ideapad 14-inch laptop (130-14IKB) is listed at a promotional price of Rs. 30,990 (MRP Rs. 46,690) on Flipkart. The laptop is run on 8th generation Intel Core i5 processor, supported by 4GB of RAM. It packed with a 1TB hard drive and runs Windows 10. Also it has optical disk drive, which is good and weighs is approx. 2 kg. it has 14-inch display along with an anti-glare coating. If you’re finding for a laptop for day to day usage, this is a good option at the price of 30K. Vu Iconium 109cm (43 inch) Ultra HD (4K) LED Smart TV (43BU113 is down to Rs. 24,999 (MRP Rs. 41,000) during Flipkart’s sale right now. That’s around Rs. 16,000 less than its usual selling price online. The bundled exchange offer can help you get another instant discount worth up to Rs. 8,000. Bank Offer10% Instant Discount with HDFC Bank Debit and Credit Cards. This TV has 3840 x 2160 Ultra HD – 4X resolution of Full HD. This TV includes 3 x HDMI: For set top box, consoles and Blu-ray players also 2 x USB: Easily connect your digital camera, camcorder or USB device. You can search for your favourite content using voice commands via the remote. The TV runs Android 7.0 along with 8GB of RAM which means you get access to all of Google’s apps as well as the Play Store.